What Is ADP’s Fundamental Value Based On Expected 2019 Results? How Could ADP’s Revenue and Ebitda Grow Over The Next 3 Years? Is The Market Pricing ADP Inc. Fairly? Paychex (NASDAQ:PAYX) is scheduled to announce its Q2 FY 2017 earnings before markets open on December 21. Paychex has reported high single digit revenue growth over the last few years, with HR outsourcing and services business driving much of the growth. HR outsourcing revenues have grown at over 15% over the last few years, while its core payroll processing business has grown at a steady 3-4% in the same period. Keeping up with the trend, Q1 FY’17 revenues were up by 9% y-o-y to $786 million with HR outsourcing revenues increasing by 15% y-o-y to $323 million. Comparatively, payroll processing revenues were up 4% to $451 million and interest earned on client funds was up 11% to $12 million as shown below. Over the years, Paychex has cemented its dominant position in the HR outsourcing market for small and medium-sized businesses. 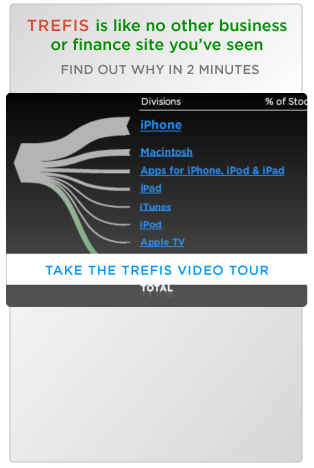 On the other hand, competing firm ADP (NASDAQ:ADP) has a significant presence in the large enterprise space. With the small business jobs market trending upward in the last couple of years, Paychex is poised to capitalize on that growth. 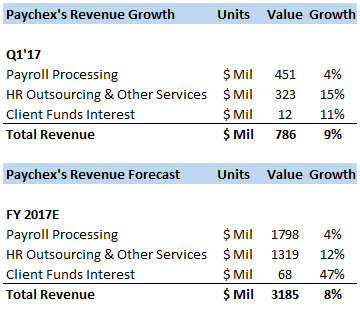 We forecast the growth in Paychex’s HR outsourcing business to continue, with the total number of HR services clients increasing by 6% through FY 2017 to 275,000 clients. The total number of payroll processing clients served by Paychex has increased at 1-2% in the last few years, complemented by a 2-4% price increase. This trend could continue, with payroll processing clients served expected to increase by around 2% for the year to 613,000 clients. The third key area of growth for Paychex in the coming quarters could be the interest earned on client assets. Revenues generated via interest on client funds for Q1’17 were up by 9% to $12 million. Despite a lower average client fund balance over the prior year period, the revenue generated was higher on a y-o-y basis due to a high yield on these funds. Over the last few years, interest rates have been extremely low, due to which the yield on client funds stayed flat at around 1.0-1.1% over the last few years. The eventual hikes in interest rates should help the company post significant revenue growth from this segment over the coming years as a result. We forecast the yield on client funds to improve to around 1.6% in FY 2017 and subsequently to increase to over 4% by the end of our forecast period. Given that the expenses in the client funds interest segment are fixed in nature, the top line growth could directly translate to an improvement in company-wide EBITDA. 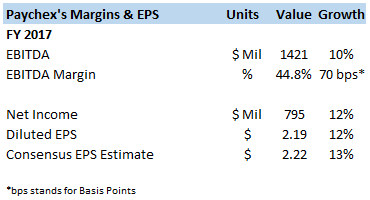 We forecast Paychex’s adjusted EBITDA to increase by 10% to $1.4 billion while the EBITDA margin could improve by 70 basis points through FY 2017, as shown below. See our complete analysis for Paychex.